Little Miss A turns 4 at the end of the month and I've just gone to look for a post about what we got up to last year and realised that I never posted one! Have no idea why and as this blog is a primarily for the kids to look back on, I want to rectify the omission by posting now. I do remember that Little Miss A's birthday celebrations seemed to go on for weeks last year! Her birthday is at the very end of March, but she was still opening presents a couple of weeks later! As with the previous year we decided not to have a party for her, opting for quality time with family instead. There's plenty of years ahead when she can have parties with her friends from school etc. It started with a birthday treat a week before her actual birthday as my parents paid for us all to go to the Gruffalo Experience in Milton Keynes. We all enjoyed the experience and Little Miss A loved having the chance to meet the Gruffalo! Then for her actual birthday we were in Brighton. We were staying with our friends so we put up a small '3' banner and had her presents waiting for her to open when she got up. We'd just taken a few token presents down with us rather than the bulky ones. I feel a bit bad that she didn't have lots of decorations etc. like I've done in previous years but she's still of an age where she doesn't really understand what a Birthday really is. She does of course enjoy the presents and cake part of it all! A few days later, we visited my parents for the weekend so Little Miss A was spoilt rotten with more presents and cake. 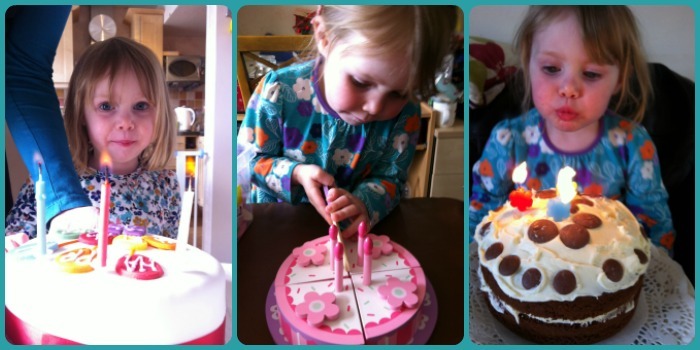 She actually had 3 cakes (2 edible) this year - I guess very apt as it was her 3rd Birthday! Finally, we visited Mr MoaB's family up North in mid-April where there were even more presents waiting for her. 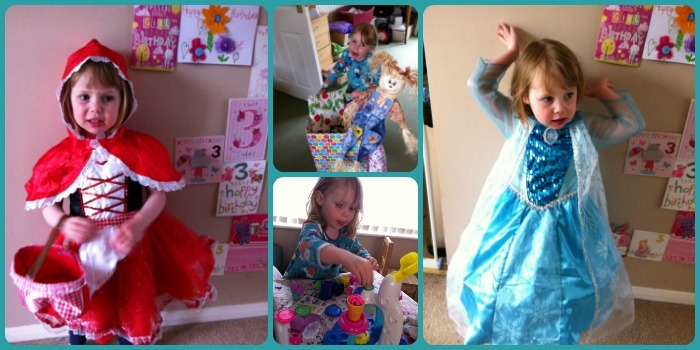 Her Frozen 'Elsa' dress was one of her favourite things and still gets worn a year later so think we're going to have to invest in a bigger size one soon! So though low key Little Miss A had lots of fun with family and friends for her 3rd birthday. We did have a bit of a belated party for Little Miss A as we were offered the opportunity to host a bowling party at Hollywood Bowl in Milton Keynes. It was nice for her to try bowling out for the first time with some of her friends and for her to have a bit of fuss made of her for the day following Baby R's arrival! And so now to plan her 4th Birthday!